Ricardo responded right away and was very knowledgeable about my a/c unit. Was very curtious and made things very easy to understand. My wife and I signed up for the yearly maintenance plan. Would recommend this company very highly. The woman my wife spoke to on the phone Danielle was very pleasant and helpful as well. GREAT JOB!!! THIS IS MY COMPANY FOR A/C ISSUES FROM NOW ON. EVERYTHING WAS PROPERLY AND THOROUGHLY EXPLAINED. I WAS SHOWN HOW TO WORK NEW THERMOSTAT. HE INFORMED ME UNIT WILL NEED A NEW CAPACITOR WHICH I WILL SCHEDULE NEXT MONTH. PLUS THIS COMPANY WAS RECOMMENDED TO BY 2 FRIENDS. GO RICARDO. IF THIS IS AN EXAMPLE OF YOUR EMPLOYEES YOU ARE TOPS. They were Awsome! Came out immediately and diagnosed problem. I made decision to buy a new system. Todd did energy calculations and spent all day at my house. A routine service call ended up all day with no details missed. Todd left a portable ac unit to use in my sons room while waiting for new unit to be installed, ( very much appreciated!). The install crew knocked everything out of the park. They are knowledgeable, quick, clean and polite. I feel like I got a great value for the price. Todd is a great American, keeps his word and delivers results. Tim is terrific ac technician, very knowledgeable, excellent customer service skills, no nonsense guy. Get it done and done right. George is a team leader, focused on quality customer service. Todd, Tim and George are a pleasure to do business with for over 15+ yrs. William was knowledgeable, kind, courteous and patient. He thoroughly explained all our options and gave a detailed description of our a/c unit's issues while fixing our main problem. His professionalism was very much appreciated. We would definitely call this company again, if we have further problems with our unit. Excellent efficient and curtious service. Irving, a Service Tech for Air and Heat provided excellent service and was very informative and professional. Ricardo Reyes came when my mother's AC drain line needed a clean out and was a big help. I'm sorta mechanically inclined, so he walked me through how to do a lot of simple maintenance and home improvement stuff myself. Took the time to listen when my mom wanted to chat him up (has more patience for that then I do, lol). Good job, Ricardo! Thanks. Irving did a great job checking out the AC units for my house. All systems looked good for now, however they are 12 years old so they will need to be replaced soon. Irving provided me the options and helped me know what to look for, when the time comes to replace. It is always a pleasure to have Tim do service work on my HVAC system. He is 100% conscientious and thorough in his work and leaves no stone unturned to be sure I understand what he was doing. He is a great credit to American Air and Heat! Thanks, Tim!! Quick and efficient. Also gave me tips to keep my system running longer. Thanks for introducing Louis to your service. He is courteous and really cares that I understand exactly what he does for me. Please include me on his list of regular clients. I hope to see him in 6 months. 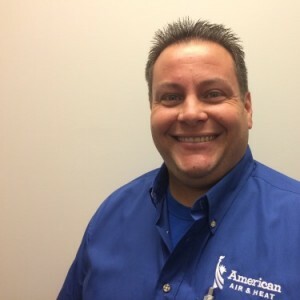 Louis M.what a great employee & technician for American Air. He took time to explain all he was doing during our maintenance appt. He gave us tips and advice on keeping our units running more efficient and prolong its working life. American Air was there when we came in from vacation and our unit was not working. after our call at 4 in afternoon for service, they were here in 45 minutes and got us working. We have had American Air service for over 20 years and recommend them for anyone needing a long time air conditioning service. Barbara in customer service will keep you informed and great on letting us know time for our yearly maintenance or any help you need. Louis was wonderful and very friendly and respectful. I would say he is a hugh asset to your company. I'm a realtor and I don't see very many techs that devoted. Great company. The team is very friendly, professional and knowledgeable. I would highly recommend American Air and Heat.